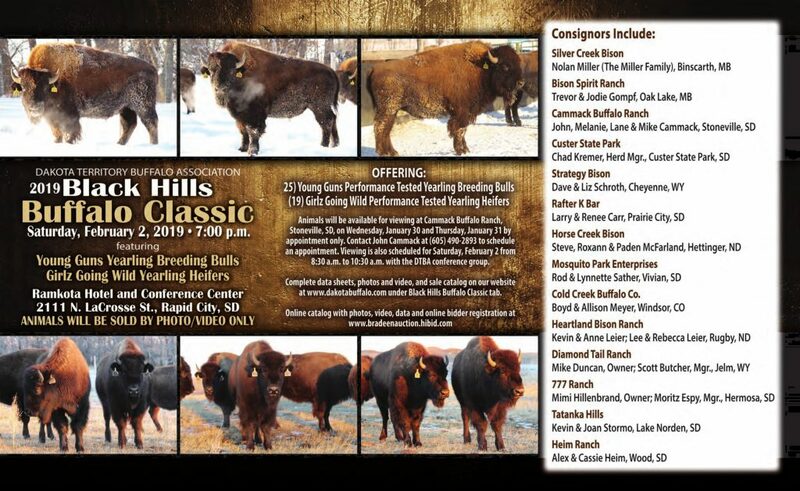 The 2019 Black Hills Buffalo Classic, featuring the Young Guns and Girlz Going Wild, catalog is now available online here. This year is our deepest class of bulls in a long time featuring consignors from South and North Dakota, Nebraska, Wyoming, Colorado, and north of the border from Manitoba Canada. Our Girlz are also looking great and can provide a lot of value for your bison operation. All animals will be available via auction at the Ramkota in Rapid City, SD Saturday, February 3rd at 7 pm MST or via Bradeen Auction’s simulcast online. Our Vision: to perpetuate buffalo as the great North American Native animal.